Oldfields Farm is perfectly situated to explore the beautiful market town of Ashbourne (3.2 miles away) that was voted the Best Place to Live in the UK in 2018 by Yopa Estate Agents. The town is Famous for its annual Shrovetide Football game and is located on the outskirts of the famous Peak District. The area surrounding Oldfields offers everything from leisurely walks to thrills at Alton Towers (5 miles away). We have a welcome folder that includes numerous ideas of activities or places to eat. For those feeling active, there is an extensive selection of maps and guide books for your perusal. If you have forgotten the wellies, we have a modest ‘welly bank’ which you are free to use. Alternatively, there are local places where you can try your hand at horse riding, 4×4 driving, paragliding, zip wire forest adventure, quad biking, swimming, paintballing, fishing, and even sailing. For those wishing to experience historic grandeur Chatsworth House, Calke Abbey and Tissington Hall are stunning properties to explore. There are also plenty of retail opportunities in Ashbourne. Stoke-on-Trent is only 30 minutes away and has numerous bargain factory shops such as Wedgwood, Portmeirion, Moorcroft and Emma Bridgewater. East Midlands Designer Outlet is a little further away but is home to some excellent bargains, including a Cadbury’s Chocolate outlet shop! If you’re looking to try something new during your stay at Oldfields Emma can host a gin tasting for you, for a small additional charge. You can learn more about how to choose the best tonic water and garnishes to make your favourite G&T even better whilst trying some gins you’re unlikely to have tried before. See our Optional Extras page for further information. 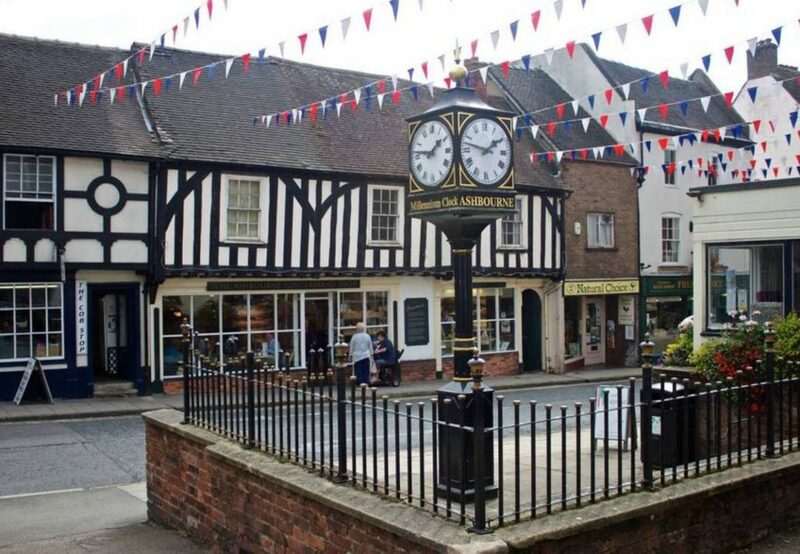 Ashbourne is one of Derbyshire’s finest old market towns, combining a medieval street pattern and historic buildings with a wealth of high quality shops. The cobbled market place, hidden alleys and yards are a delight to explore, and the wide and elegant Church Street is considered to be the finest street of Georgian buildings in Derbyshire. Run by Ashbourne Shire Horse Society, Ashbourne Show provides a wonderful day out in mid-August with entertainment and competitions for people of all ages and every background. Alton Towers is one of the UK’s biggest theme parks and is only 15 minutes away. There are roller coasters like Oblivion for the adrenaline junkies, CBeebies Land for the little ones and a year round Water Park. Bakewell is famous for its delicious Puddings, annual Show and for receiving royal charter as a market town in 1330. Markets are still held every Monday in the town centre and there is a thriving livestock market. The town has a long and fascinating history; mentioned in the Doomsday Book of 1085,`Badequella’ meaning Bath-well. Make sure you take some bread with you to feed the numerous ducks, geese and enormous fish! Buxton Spa was created by the Romans and developed around thermal springs in the Wye Valley. The Elizabethans and later, Mary Queen of Scots also ‘took the waters’. The old town grew up around the market, but not until the building of the Duke of Devonshire’s Crescent in the 1780s did the spa really began to take off. The Crescent was built on the profits from Ecton Copper Mine and was a copy of the larger Royal Crescent in Bath completed five years earlier. Some excellent coffee shops and cafes can be found there. Calke Abbey is a country house with a difference. There are wonderful walks, a deer park and an historic kitchen garden but there is also a wing of the house that has been left unrestored to highlight the restoration process that National Trust Properties go through to bring them back to their former glory. Carsington Water is a stunning reservoir surrounded by fantastic walks and cycle paths. There is a water sports centre where you can try your hand at windsurfing, kayaking, stand-up paddle boarding and fly fishing. For those feeling less adventurous there is an excellent ice-cream parlour and when the weather is good you can relax on the ‘beach’ at the edge of the reservoir. Chatsworth House has everything you could want in Country House; stunning backdrop, adventure playground, lovely gardens, great walks and farmyard fun. To make the most of the area you may need a 2 day visit, especially if you want to also see the beautiful village of Baslow were you can have afternoon tea in the Devonshire Arms or a meal at Lupo’s Italian restaurant. Dovedale is located within the Peak District National Park and owned by the National Trust. You’ll see many sheep on the rocky slopes and in the woods. The famous stepping stones are a short distance from the car park at the front of Thorpe Cloud and the cave like Dove Holes. The stepping stones appear on thousands of post cards and the area attracts a million visitors a year. It might be best to avoid on sunny weekend afternoons. Haddon Hall is a fortified medieval manor house dating from the 12th Century and is the home of Lord and Lady Edward Manners whose family have owned it since 1567. It is also the location of many films including Jane Eyre, The Tudors and Pride & Prejudice. The family chapel is truly breath-taking. Well worth a visit. Tissington Trail runs along a 13 mile route from Ashbourne to Parsley Hay. Surrounded by beautiful countryside the traffic-free trail is ideal of horse riders, cyclists, naturalists and walkers. It is suitable for wheel chairs and pushchairs along the flat sections. Trentham Gardens & Monkey World is set in a beautiful country parkland estate. The monkey forest allows you to walk through the woodland home of a group of free-roaming Barbary macaques. Being able to get so close and experience the lives of such cheeky animals is a unique experience. Within the estate you can also find a shopping village and a beautiful lake where you can take boat trips. Sudbury Hall is a National Trust property with the UK’s Museum of Childhood. A fun and educational day out for the young and young at heart. Oldfields Farm is perfectly situated to explore the beautiful market town of Ashbourne (3.2 miles away) or the famous Peak District.